Anja Stokic, Benefit Cosmetics Etail Manager. What does the beauty industry mean to you? To me, the beauty industry is a community of like-minded women who like to pamper and be the best version of themselves! Equal representation and treatment of both men and women – regardless of the situation. What makes a good #girlboss? Confidence! A girl who is not afraid to chase her dreams and supports others along the way is always inspiring. In my role I am constantly learning! The reward is that ultimate satisfaction when you know you’ve achieved a certain goal that you worked really hard on. What advice would you give to young women who want to make it within the beauty – or any – industry? What are you favourite Benefit products? I CANNOT imagine a day without Gimme Brow, Roller Lash and Hoola! This Christmas, treat the brow lover in your life (or yourself!) 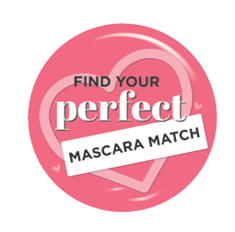 to the ultimate kit from benefit cosmetics! PLUS your chance to win a set worth £118! 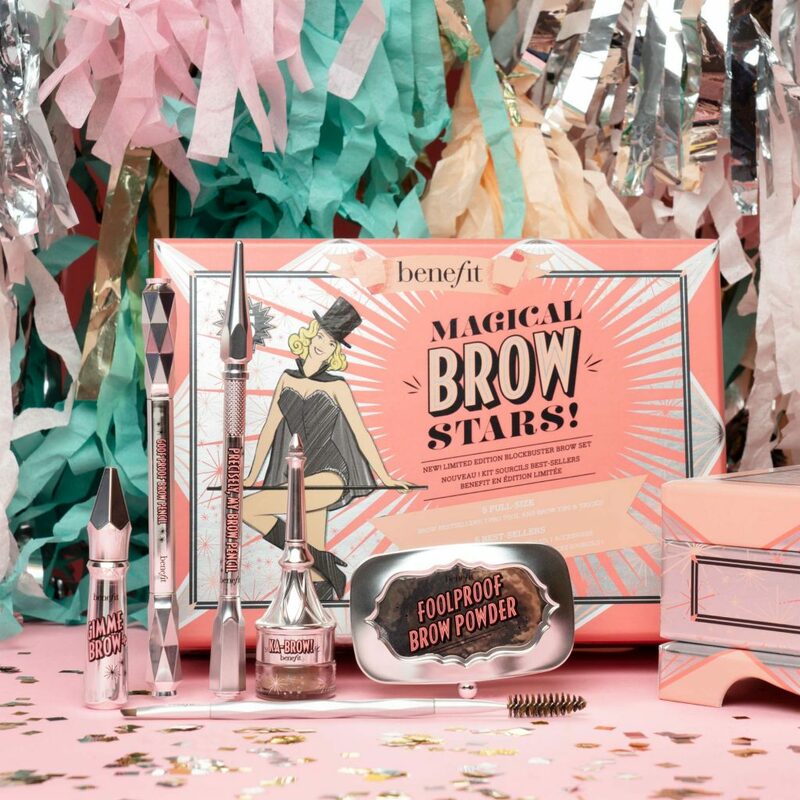 NEW from benefit cosmetics this Christmas, the limited edition Magical Brow Stars kit contains five FULL-SIZE brow faves, plus a pro-brow tool and tips and tricks for the perfect brow. From brow pencils, to powders, gels and more, this set has everything you need to transform your brows… all in an adorable magic brow trunk! Stuck for ideas this halloween? 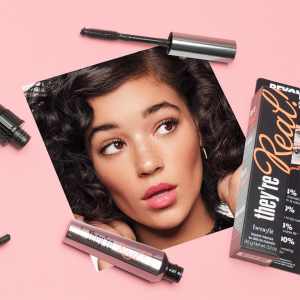 We can’t get enough of this look from benefit cosmetics! ‘Fortnite’ ‘Harley Quinn’ and unicorns might be the leading searches for halloween costumes in 2018, but we’re *obsessed* with this Pierott look from Amy-Lou Faulkner, event co-ordintator and make up artist at benefit! Step 1: Start by applying Porefessional Pearl all over your face – your base needs to last through trick AND treat! Step 2: Next, apply Hello Happy foudndation in shade one (the lighter the better to create that ghostly glow! ), and Boiing Airbrush Concealer in shade one to build fiendishly flawless coverage. Step 3: Using Gimme Brow+ Eyebrow Gel, gently fill in brows to add a soft definition to your brow’s arches. Then, to open the eyes out, sweep High Brow highlighter pencil under the arch and blend. Step 4: Using the Vanity Flare eyeshadow palette, sweep the shade ‘Ripe Plum’ over the lids to add hollow contour to the eye. This needs serious smoking and blending – the bigger the better! Follow by using They’re Real Push Up Liner in black to line the top and water line. 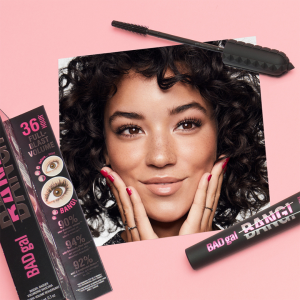 Step 6: Next, grab BadGal Waterproof Eye Liner Pencil – this is for your lips! I used the joker as inspiration for this and over lined to create devilishly devine pout. Once you’re happy with the shape, fill it in and add a little lip balm to create a sheen. Step 7: Go Go Tint time! Perfect for creating the pink nose, Go Go is waterproof so will stay in place all night long. Step 8: Finish the whole look by lightly contouring your cheekbones with Hoola Contour Stick, and sweeping Dandelion Twinkle across the forehead and down the nose for a bootiful glow! I added stick on craft gems to complete the look. It’s all go backstage at the Paul Costello presentation at the BFC show space. Show time is at 9:30 and we have many models to makeup. 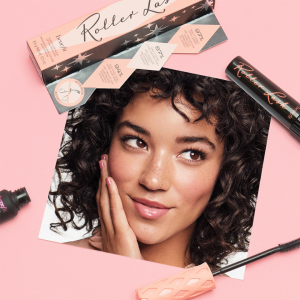 So, with a Costa Coffee in hand we excitingly watch as Lisa Potter-Dixon – AKA ‘LPD’ – Head Trend and Make-Up Artist at Benefit Cosmetics, creates one of the two looks for today’s show. 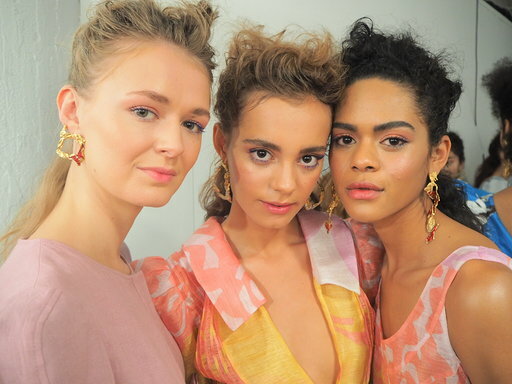 JOY’, was Paul Costelloe’s inspiration behind the SS19 collection of rainbow brights and optimistic silhouettes. Powerful enough to stop the traffic from Piccadilly Circus, to Madison Avenue on a sunny spring morning” – Paul Costelloe, Designer. I wanted to create a look that emulated Paul’s inspiration of ‘Joy’. Fresh clean skin and full brushed up brows were the perfect base for a vibrant pop of colour. 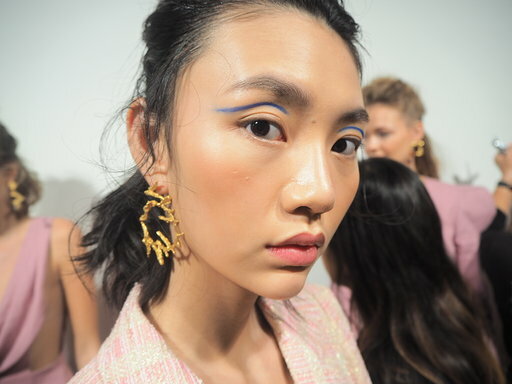 Using a flash of blue was a modern take on the classic flick, whilst the peachy hues brought a flirty and playful side to the look” – Head Make-Up Artist & Brow Expert, Lisa Potter-Dixon. The presentation is full of vibrancy and Joy! With classic silhouettes and bold prints, the music is fun and uplifting giving spotlight to music from the OST of ‘Mamma Mia: Here we go again’. Watching how the makeup, hair and fashion come together brings me so much JOY! 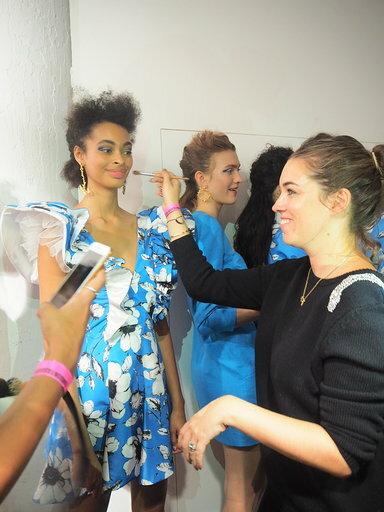 LFW shows are always full throttle, brow-arching, cheek blushing fun – can’t wait for next year! Brows are dressed with Gimmie Brow+ and Precisely My Brow pencil – a double act is famed for creating a full-volume, feathered brow. What we gain in brow we lose in shadow, so keep them bare in this case. This look is all about the electric blue socket line. Created by using They’re Real! Push-Up Gel Liner in Beyond Blue. All emphasis is on the socket line with no mascara on the lashes. Each line is slightly different as we adapt to suit each models eyelid. Brows are styled in a ‘barely there look’ using 24-HR Brow Setter to give brows hold and keep them tidy. GALifornia blush is applied on the eyelid and buffed to create a sunset hue, followed by They’re Real! Lengthening Mascara in Beyond Blue applied in a manner that says ‘I’m running super late’ way to half of the top and bottom lashes. 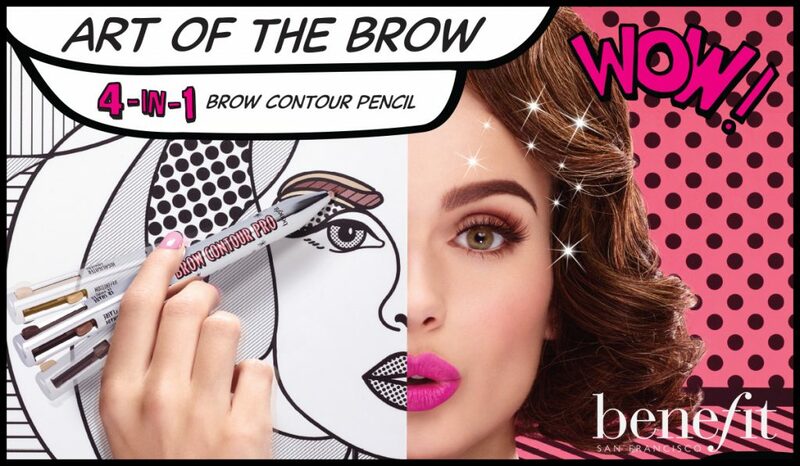 Define and higlight your brows with NEW 4-in-1 Benefit Brow Contour Pro pencil! A multi-tasking brow pencil that features a lighter brow shade, darker brow shade, edge definer and arch highlighter to create clean, shaped brows with depth and dimension. Turn shapeless, flat brows into defined, contoured brows in an instant! How to apply: click and contour! Start by pressing down the lighter shade tab and twist until you see product. Fill in brows with the lighter shade from start to arch. To switch shades, simply press down the tab of the selected shade unril it clicks in place and twist for product. Next, fill in brows with the deeper shade from arch to end. Use the definer shade below and above the brow, and gently blend. Finally, use the highlighter beneath the arch and blend outward – voila! Top tip: use the Benefit dua-ended Brow Blender for ultra clean edges and tamed brows!